At Steenbergs, we are undergoing some changes to our loose leaf specialist teas. Last year, we redesigned the labels to be bespoke for each tea type and with better descriptions on making tea, as well as being bright and fun looking. Next week, we should also see the arrival of our own new bespoke tea tins - they are in a matt black with a roundel on the top with our name "Steenbergs Tea Merchants" printed in it, which is pretty exciting. Allied to this, we are going over the specialist teas that we sell to give the Steenbergs range of teas more breadth and more interest. So I am tasting, for my sins, green teas and oolongs over the next few weeks. Today, it is the turn of Japan and their green teas. I like the clean pallet of Japanese green teas without any hint of bitterness that quite often mars commercially purchased green teas from the high street - that's not healthy and good for you, just plain disgusting tea. I have chosen some lovely Sencha Fukujyu and Bancha teas, plus a Genmaicha, which is a weird, but traditional Japanese green tea, made by mixing Sencha with Rice Kernels (genmai) giving it a nutty flavour like drinking green tea with unflavoured popcorn mixed in - wacky but quite cool. The popcorn-looking stuff in the Genmaicha are actually rice kernels that pop during the roasting process. At this stage, I have not gone for a Matcha as I am not sure with the samples that I have tasted so far. But I really love the Gyokuro green teas. I have particularly enjoyed two of these - an organic Gyokuro and a truly exquisite Gyokuro from the Tanabe District near Kyoto. The Tanabe Gyokuro is grown under special bamboo shades for a tea with a unique flavour and is processed only from a small first flush; this should give a delicate, round flavour with a delicate, pale yellow-green colour. These teas have a delicate, sweet flavour with hints of sweet damp hay coming through that's typical of good green teas. The tea cups a light yellow green colour. 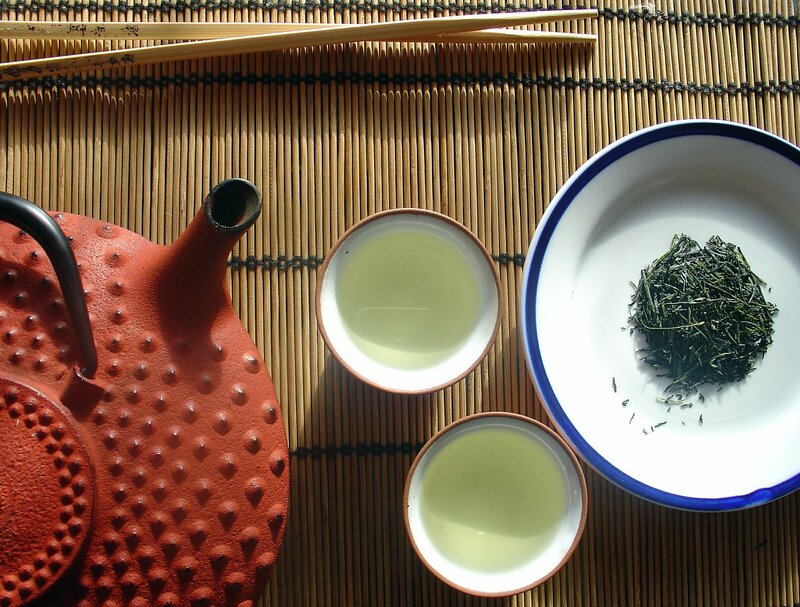 What are your favourite Japanese green teas?